Are you struggling to deal with your little one’s sleep regression troubles? It can be really tough to finally get on top of your baby’s sleeping pattern, only to devastatingly end up back where you started. However, sleep regression is unfortunately a common and guaranteed problem. Experts say there’s four sleep regression stages which crop up between 4 and 24 months. The two main, most challenging stages come at 18 months and 24 months. However, the other two are no walk in the park either when you’ve finally started to enjoy some uninterrupted sleep. If your little one is going through sleep regression, there’s some tips and advice which can really prove invaluable. Here, you’ll discover 10 awesome tips to help you survive this challenging period. When your little one starts to regress with their sleeping pattern, it’s common for parents to think about changing their routine. However, you need to be really careful not to make any long-term changes to try to solve this short-term solution. All sleep regression stages last for short periods of time. However, if you start to make any long-term changes, you risk prolonging the sleep issues for months. Try and stick to the same routine as much as you possibly can. Where do they currently sleep? If the answer is in your room, you may want to consider making them sleep in their own room. Obviously, this isn’t an option if you prefer to co-sleep with your little one. However, if it is an option you’ll definitely want to take it. Learning to sleep in their own room will give your baby a greater sense of independence. This will ultimately help with long-term sleep habits, ensuring you both get a good night’s sleep. Some parents find the transition a smooth one, but others can find it quite challenging. Just remember, persistence is key if your little one is having a hard time with the transition. If you don’t already have one, a white noise machine can work wonders for the early sleep regression stages. It mimics the sound your baby would hear in the room, providing comfort and helping them to drift off. You might just be surprised how well these machines work for helping you to establish a good sleeping pattern. If you don’t want to pay for a machine, you can also use apps on your phone or tablet device. There’s a lot of great white noise apps you can download and try out. Although you don’t want to make any drastic changes during the sleep regression stages, giving your baby an earlier bedtime might help. The trouble is, many babies nap too much during the day and have a late 9pm-10pm bedtime. If you were to alter their nap schedule and bring their bedtime forward to 6pm-7pm, it can really help to ensure they get a better night’s sleep. Remember, the older baby gets the more sleep they need. So, putting them to bed at 7pm-8pm can ensure they get the necessary amount each night. This tip alone could prove to be a real game changer for you. Even with the tips on this list, there’s going to be times you feel like giving up. Sleep deprivation can really cause you to feel like you’re losing your sanity. So, on those darker days it’s a good idea to remember the good stuff. Look through your baby’s newborn photos and think about the milestones they’ve achieved so far. This is sure to bring a smile to your face and help you remember why you’re putting up with these tough times. Cling on to the good memories and it will really help to get you through. Another tip which can help a lot during the bad days, is to change your perspective. Try not to think of the sleep regression in a negative way. Instead of focusing on the fact you’re being kept up all night, see it as a simple change in schedule. You may be losing sleep at night, but that doesn’t mean you can’t top it up during the day. Have little naps, even just 5 minutes where you can. If you start to view it in a more positive way, you’ll be amazed how much better you feel. When your baby is fussy during their sleep regression phase, make use of pacifiers or swaddling to calm them. You may already be using a pacifier and it isn’t working. If not, swaddling is definitely something you’ll want to give a go. There’s a lot of online videos showing you exactly how to swaddle a baby correctly. When done right, it makes them feel protected, comforted and it can often send them off to sleep. Sleep regression doesn’t just strike at nighttime. It can also have a dramatic affect on baby’s naps. If you’re finding your baby isn’t taking kindly to their usual nap routine, placing them in a baby swing could help. The swing keeps them happier, while also encouraging them to drift off for a nap. The only thing to remember here is to supervise them while they’re in the swing. Leaving them alone can be dangerous, even though it might seem like they’re safe and secure. Sleep regression is hard work so never be ashamed to ask for help. Ask friends or family to watch baby during the day while you enjoy a much-needed nap. Ask your partner to help during nighttime wakeups. Whatever help you can get, take it! Now’s not the time to try to be a super parent by doing it all yourself. On the bad days, it’s perfectly OK to vent your frustrations. Cry, shout, have a little rant online – whatever works for you, do it. Bottling up stress and frustration will ultimately lead to breakdown. So, having an outlet to release your frustrations can prove essential. If you’re not comfortable venting to friends and family, join an online parenting forum. You’ll be surprised just how many parents feel the same way you do right now, and they may even have a few tips of their own which can help. 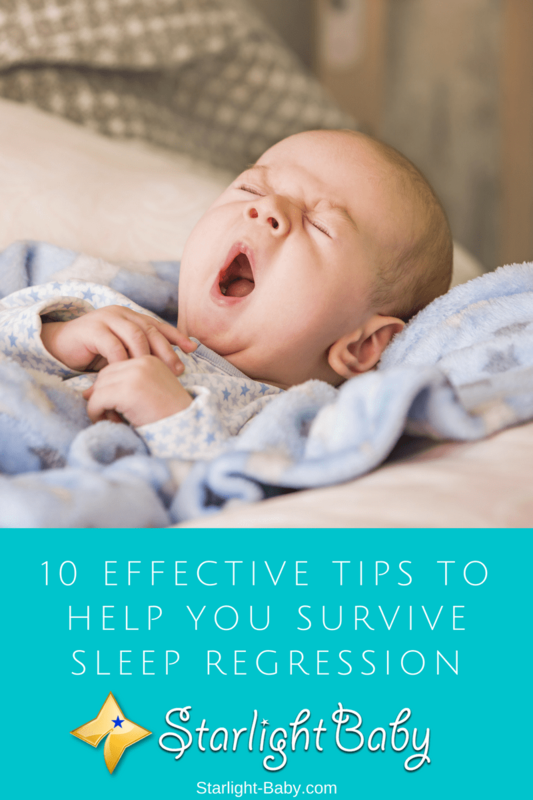 Overall, sleep regression is a very real and frustrating problem you’ll face numerous times throughout baby’s first couple of years. However, the tips above can really help you to deal with the stress, frustration and anxiety which tends to come hand in hand with the sleep issues you’ll face. From my experience as a parent, I would strongly say that no parent does it all alone and still be in one piece. No matter how good one think he or she can effectively take care of the baby, it doesn’t always go according to plan, so therefore it’s very important to ask for help when there is need for it. So true, Martinsx. A parent or parents may be able to handle the baby’s care initially by themselves, but in the long run, they would need a breather to keep their sanity. Parents should never hesitate to ask for help if help is available. Even a few hours away from it all will hugely help relieve stress. My baby has very active hours and I always find it hard to put her to sleep. It is always WWII between us each time I attempt to put her on sleep. And what I previously observed on her was that she kept on waking up between her sleep because of hunger and wetness. So what I always do now is keeping her busy playing with her toys and big sisters, and feeding her during her playtime. When she has the urge to sleep, I clean her up and put her on a good diaper so that once she goes to sleep it will always be a good one. And it actually works for my baby. By the way, I also sleep with her during her sleeping periods to compensate some of my sleep deprivations. Just as I often say, parents know their kids’ sleep patterns better so once they already know the baby’s routine, they can work around it until things fall into place. You did great in adjusting your baby’s sleeping pattern so now, both of you could get a much-needed sleep. Good job! It is very interesting to note that babies change their habits and behavior very frequently. A couple of weeks ago, my baby would easily fall asleep whenever I sang to him and pat and stroke. However, these days, he does not fall asleep until he suckles his mother breasts. One of the good ways to promote sleep in babies is let them play until they are tired. This will help then fall asleep easily. Yes, so true. I used to do that when my kids were young because if they’re not tired, they only take short naps. When I allowed them to play to their heart’s content, I was assured of a restful sleep for both of us. It is not always easy for nursing moms to handle the case of sleeping regression in their babies especially when they are finally getting to understand the way the baby sleeps. However, these are wonderful tips on how to handle the situation which one can easily use and get things better with nursing the baby.